We’ve been yearning for a new BMW 8 Series for years, and now it’s finally here, having debuted at the 2018 24 Hours of Daytona. One of the best parts about Daytona is the ability to get up close to the different cars and look at all of the interesting parts. We got that chance with BMW’s new M8 GTE, which is the car they hope to take to the 24 Hours of Le Mans later this year. It must be noted that it was a rough weekend for BMW Team RLL, who is responsible for the M8 GTE’s racing debut. It’s always tough for series to equalize the performance of the different GT-class cars on track so vastly different cars can compete with each other, especially when they’re new and relatively untested. For this weekend, the team believes their car isn’t allowed to make enough power to be competitive. The M8 GTE’s engine can make up to around 600 horsepower, yet it’s making nowhere near that this weekend. IMSA adjusts the amount of boost its turbocharged GTE cars can run as one way to even out the performance of the different models in use, and one team member estimated that they may be as much as 60 hp down on power. BMW also ran into issues getting the car legal for the GTE spec, with changes requested at the last minute. As a result, the No. 25 car has slightly more test time, but both cars were built over Christmas to make it here. Then that No. 25 car had a major tire blowout after the tire was cut by debris that forced it to lose time back in the garage for repairs. Regardless of the changes and struggles, though, the team feels as if they have a real contender, once it settles into the mix of cars well. It’s the first time BMW has debuted a race car before finalizing their road car, but hey—it worked for Ford with their GT, which won Le Mans in its first year back. The engine sits low in the engine bay, and is pushed further towards the middle of the car. While it’s based on the road car’s engine, it’s a stressed member in the car—as in, it’s integrated into the very structure of the car itself, which saves some weight. You don’t need a race car to isolate the engine vibrations with the use of engine mounts for comfort—you need it to go fast. Leave off everything that doesn’t go fast, duh. That engine is based on the one in the M6 GT3, but this one is even more off the motorsport-specific deep end. BMW Motorsport Director Jens Marquardt estimated that the M6 GT3's engine was about 95 percent production, and the version used in the M8 GTE—codenamed the P63—is only about 40 percent production-based. Tweaks like the addition of a flat-plane crank were made to make it more efficient, durable and powerful. The usual kidney grille has been widened out in the front to keep the engine as cool as possible. The hot side is more separated now on the engine, which they say allows them to improve boost control. It’s all controlled by new Bosch electronics where the traction control even has a self-learning algorithm. Like a Porsche 944, the M8 GTE uses a transaxle that’s located in the rear. The M8's is a sequential transmission made by Xtrac, though, and usually only uses the clutch to engage first gear, or occasionally to downshift more smoothly in the rain. Something that drives certain symmetry-obsessed people nuts is immediately noticeable in the back: the off-center air scoop, which surprisingly feeds into the brakes. A trunk full of air ducts. Another cooler under the ducts. Like many other GTE cars, the entire thing is assembled like a big Lego car, with whole chunks of the body that come off in one big piece and quick-mount hardware. Only a handful of fasteners have to be undone to unbolt the entire rear quarter panel, for example. Parts from under the car. Note the channels to send air under the floor as well as the ducts near the back that cool the brakes. Air comes in through a scoop on the back of the M8 GTE’s roof and feeds into those brake cooling ducts. The belly pan, which has massive integrated cooling ducts, comes off as one big piece. Entire side skirts also come off as one easily detachable piece. Those side skirts also help widen the car from the metal body it shares with the upcoming production car. Front bumper is all one part. Routed through part of the side skirt and surprisingly through the passenger side of the car are the dual exhausts. There’s no need to worry about carrying a passenger, so they just use that space for exhaust. BMW focused a lot of attention on the aerodynamics of the M8 GTE. The rear of the car became narrower as a result, and the rear wing was supported at the top to improve the flow of the air around it. The floor of the car has a lot of powerful downforce as well. Fluids inside the door, easy to swap. Inside, the pedals adjust for the drivers. Fluids for the brakes and clutch are easily accessible, tucked into the front corner of the inside of the door. Power-assisted steering keeps it light and easy to handle. A center screen includes both a rear-view camera as well as a radar system that pinpoints far faster traffic behind them. So far—at least at the speeds it’s allowed to achieve—the drivers told us that it was fairly easy to drive. A new steering wheel helps some. But this time, it’s not going to be the fastest. In the end, the No. 24 and No. 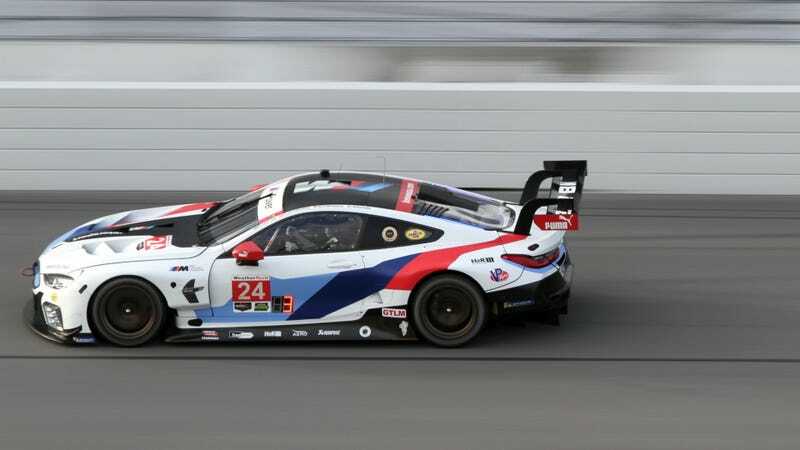 25 BMW M8 GTEs finished seventh and ninth in the GTLM class—the latter of which is at the very bottom. Hopefully they and the series work out a solution to get the car more competitive for the 12 Hours of Sebring, because it’s entirely too cool not to be. Like any good race car, there are handwritten notes where there needs to be. Close-up of the side of the rear bumper, complete with a tribute sticker for Stevenson Motorsports’ team owner Johnny Stevenson. BMW uses laser lights on their front bumpers for maximum visibility. Enormous rear bumper and diffuser.